I grew up in Minnesota and spent many days fishing rivers with my dad. I majored in biology in college and planned to pursue an advanced degree in ichthyology. After graduating, I worked on streams for a number of natural resource management agencies. I realized that to better understand the behavior and population dynamics of my favorite catostomidae (Moxostoma carinatum, if you were curious), I should learn about the physical processes shaping their habitat. 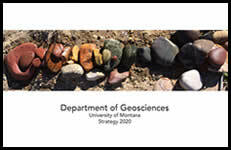 This lead me to the Department of Geosciences at the University of Montana, where I am working toward a Masters degree within the field of fluvial geomorphology. I appreciate the interdisciplinary nature and many applications of geomorphology, and am eager to apply these principles in my future work.